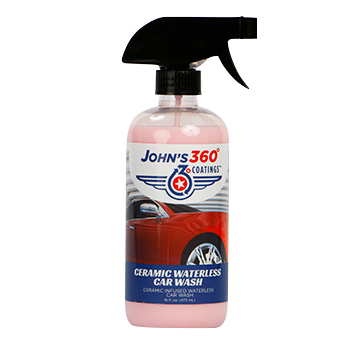 16oz — John’s 360° Coatings® Ceramic Waterless Car Wash spray is an advance ceramic waterless car wash spray, paint sealant, clay lubricant and detailer. This multipurpose product is easy to use: simply spray on, rub in and wipe off! This is an essential product to add to your auto, aircraft or boat detailing supplies. It quickly cleans, polishes, and protects. The soaps and liquefying agents in the formula safely dissolve dirt and grime on contact, and, unlike other waterless car wash products, the SiO2 ceramic coating in our formula creates a water-beading effect and shine that lasts up to 30 days. Guarantee: Personal service. Relentless dedication to quality. Your happiness, or your money back.